I’ve been asked many times about the model changes on the Heidelberg platen. Since the hot new letterpress community is generally made up passionate newbies with little or no previous background in printing, they are coming to realize that a Gordon platen can take them only so far. The letterpress field is growing fast as more and more want to feel and touch something that is magical. Somehow, people think the Heidelberg is relegated to two versions: the black ball and the red ball. Actually, there was also a steel ball before the phenolic black ball appeared. These references mean nothing. There are much more important differences that some may wish to know. 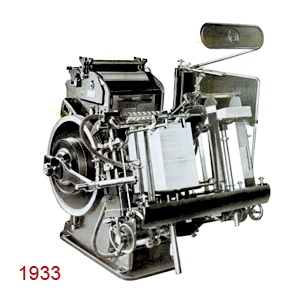 Suffice to say, the modern Heidelberg Platen began in 1950. The color of the impression lever ball is of no consequence. First version with register feature using gauge pins. Levers for easy adjustment of bearer height, safety guard, Side shelf. Registration with brass gauge pins, sheet counter, and speed increased to 4,600 s/h, rider rollers for color work, front table cast in one piece. Shearing collar safety device. Very few machines made during WW II. Same as Superspeed, continuation of press built before the war. Variable speed pulley controlled by operator hand wheel, new blow-down device for delivery, sheet jogger standard. Flip away safety guard, Central lubrication pump, ball bearings for forme rollers, increased toggle strength, wash-up device, drop-down ink fountain, tool shelf. 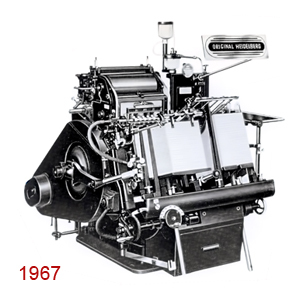 To celebrate Heidelberg’s 100th anniversary brought prior to Drupa 51. 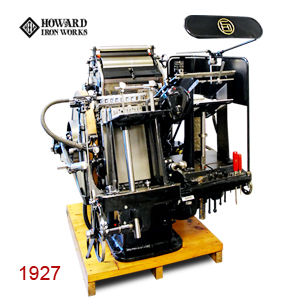 Officially launched at the first DRUPA in 1951. Essentially same as above, but with thin tissue adjustment added. 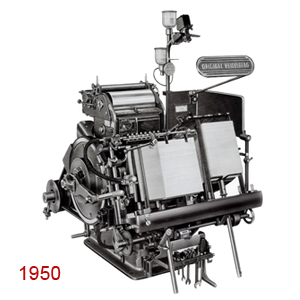 The so-called “Red” ball made its Drupa appearance although already in the market by 1960. Virtually the identical machine to 1950. Press speeds increased to 5,500 s/h. New tool shelf under table, plexi cover over ink fountain, disconnection of forme rollers, dry anti-offset powder device, built-in speedometer, safety cover for flywheel now completely covers wheel. In some countries , especially Great Britain, the encapsulated cover had already been made mandatory years before. 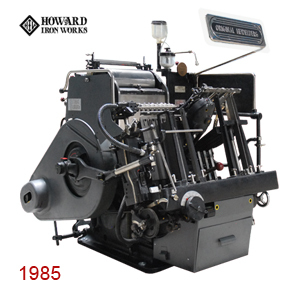 The “TP” hot foil stamping model introduced with 200-ft roll. Safety guard now changed from elliptical to rectangular. Enhancement of safety elements. The flywheel guard now has an upper portion, several other guards are added and various points on press. TP foil roll increased to 1,000-ft and max. 8" pull. Production stops. The last model has even more safety guards but no structural changes. The most relevant prerequisites for selecting a Heidelberg T platen are condition: how does it sound? What condition is the register device? If it’s mangled then the press has probably been in a smash and you need to then look at the grippers. Other than condition, it's irrelevant the color of the impression knob, or if it has the tissue paper control. Pick a machine that has central lubrication and wash-up. These are the most important. Any machine after 1950 (Serial No. 50,000) is a good bet. In the machinery business, we always used the “100,000” Serial No. as a sort of benchmark to distinguish old from new. 100,000 was reached in 1955.